WARNING: This is long. It takes more like two minutes to read, not 37 seconds. But it's worth it. 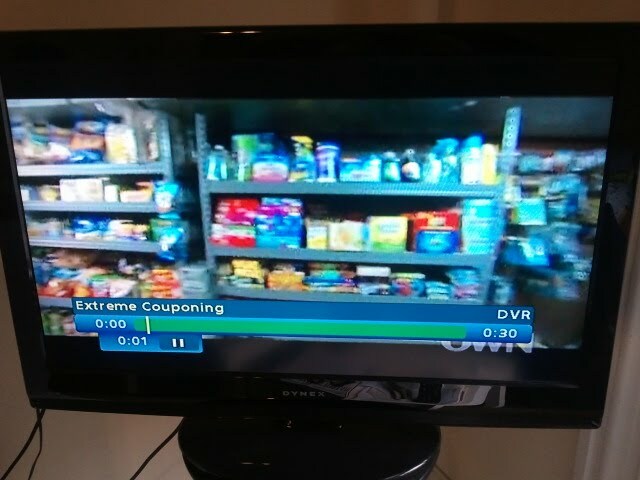 In my attempt to avoid post Superbowl coverage, one of the things that has come across my television is "Extreme Couponing." It's a show about insane people who live for "saving" the most money they can with coupons. The first thing you need to know about it is that the word "coupon" is a verb. 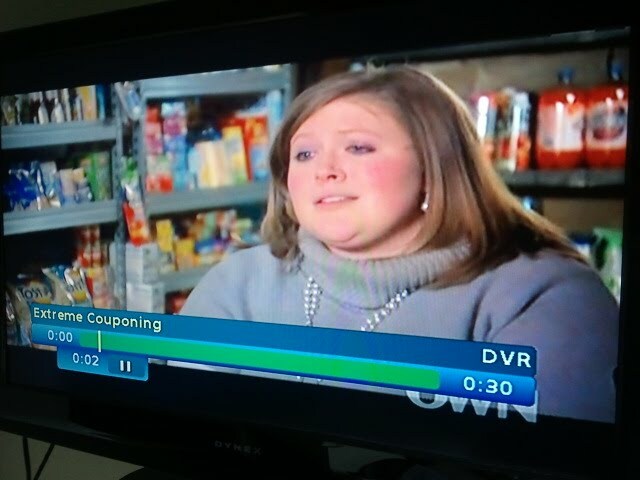 For example the lady in the picture said "I feel like I've been blessed with this talent, being able to coupon is what's allowing me to enjoy my life." The second important thing is that these people have what they call "stockpiles." They fill their basements, bathroom closets, and sometimes children's bedrooms with enormous amounts of groceries and other products they buy in mass quantities (also pictured below is the aforementioned lady's "stockpile"). A different crackpot women on the show said "I do think my stockpile is almost as beautiful as my family." The average shopping experience on the show involves several hours of research. They meticulously sort through hundreds of coupons and store ads, often deciding to buy large amounts of things they don't even want/need because they "make money" on them. For example, if the store has a sale on cat food 3 for $5, and they have a coupon for $1.25 off that cat food (and the store doubles coupons) they can technically buy one for negative 83 cents, and apply that savings to other purchases. Even though they don't have a cat. 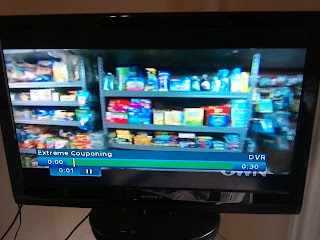 My favorite part of the episode I saw was when the lady above bought 35 bottles of Maalox (although looking at both her and her "stockpile" that may well be something she actually needs). The other thing that happens is they make detailed lists in which they divide the items they are going to buy into separate transactions, because they often have several of the same coupon but are only allowed to use one per transaction. The kook who likes her collection as much as her family split up two shopping carts of stuff into 18 different transactions. How the staff of these stores doesn't freak out on these people is beyond me (I know it's fake for TV, but it must also happen in real life). Sometimes the store doesn't allow this though. In the case of the lady in the picture, she wanted to split her load into 7 transactions because the store was having a sale for $10 off every $50 spent. However, there was a rule, just one transaction per person. So after she and her husband went through, they decided to call all of their friends and waited until 5 of them could show up to help them finish checking out (Imagine if a friend of yours called you up and said "Hey, I need you to come down and meet me at the grocery store so I can save $10"). This lady bought $562 worth of stuff for $25. But that's NOT what blows my mind about it. Sure she "saved" $537. But she bought things she didn't want. She did several hours of research beforehand (not to mention they had to go to the store at 6 am to make sure it had everything she "needed"). She and her husband were in the store for 5 hours (one hour just to check out), plus their 5 other friends all had to take an hour out of their day to come help. And then she had to go home and put it all away. So my question is, what is her TIME worth? It calculates out to about the same as if she'd just gone to work as a cashier in the store she shopped at. You should watch less sports and more junk like this. This lousy show's been out for a while. Your take on it is perfect. Thanks!